A heavy duty TVX-16 friction weld pallet strapping tool, designed for 16mm polypropylene or polyester strapping. Purchase comes with a rechargeable Li-ion battery and charger. 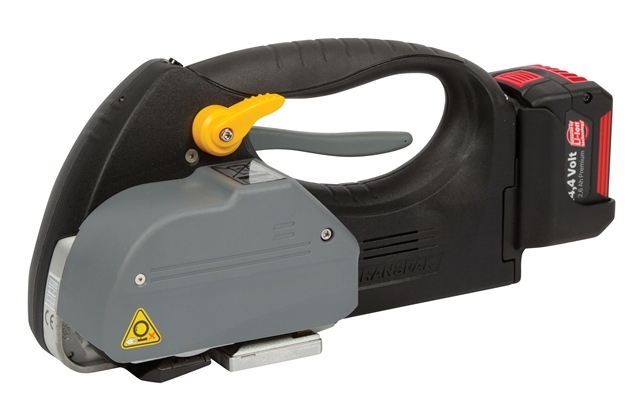 This automatic single button function battery powered friction weld strapping tool provides a high quality tension and seal, and maximises productivity, increasing presentational look and securing boxes and pallets much better than using standard hand tools, as well as reducing labour costs. The TVX tool is one of the fastest on the market - in less than 3 seconds, the strap is tensioned, sealed and cut! The ergonomic and rugged design assists maximum operator comfort, with minimal effort. Packages such as boxes, pallets, bales and crates can be safely strapped. Strap feeding is extremely simple, with both straps being inserted together. The TVX has an exceptional tension range and applies up to 240kg (2400N) with ease. The flexible sealing mode allows you to choose from semi automatic or single button fully automated operation. Warranty: This machine comes with a 12 month manufacturer 'return to base' warranty. In the event of a breakdown (which is extremely rare), simply send the machine to the manufacturer and they will repair and send back to you.